The Coffee Scoops are made of high quality 18/10 stainless steel with mirror finish, rust proof, antioxidant, heat resistant, dishwasher safe, premium material, sturdy and durable. 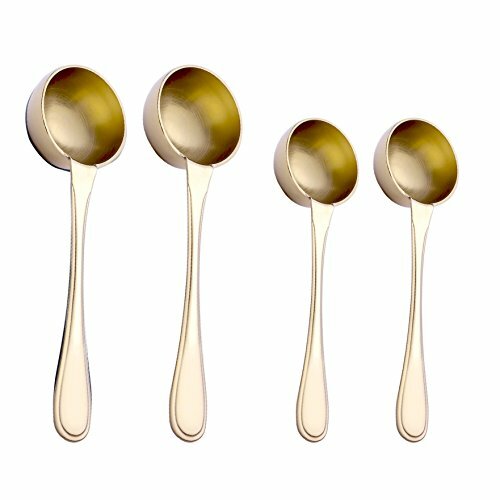 This gold Measuring Spoon take all the guesswork out of your daily measuring needs (PRECISE MEASUREMENTS). Black, Gold are the original stainless steel outer vacuum plasma coated. Completed electroplated with Titanium metal , rustproof, high hardness, no distortion, Lead-free, Cadmium-free, Phthalate-free, BPA-free durable and eco-friendly, because it is metal, not paint, so no paint chips. 2 x Coffee Scoop 1 tablespoon (15 ml) - Length: 5.5 inche, Weight: 1.5 oz. / pcs . 2 x Coffee Scoop 2 tablespoon (30 ml) - Length: 6.5 inche, Weight: 2.0 oz. / pcs . 1. Keep your products clean. It can make the material in fresh status. 3. Wipe it after used . [ HIGH QUALITY & WELL MADE ] - The Coffee Scoop is made of high quality 18/10 stainless steel and more durable. Heavy, solid, well made, attractive. Modern & well-balanced proportions to seek good touch feeling .The color gold made it stands out and is unique. [ 4 PCS in 2 SET COFFEE SCOOP INCLUDES ] - 2pcs x 1 Tbsp coffee scoop and 2pcs x 2 Tbsp coffee scoop. The ladle is an indispensable kitchen utensil, perfect size, exactly what you expect from your silverware. The non-descript design matches almost any set of dinnerware style and are perfect for fancy or casual use. Looks great on the table and you will get a lot of compliments. [ NICE WEIGHT & ACCURATE MEASUREMENT ] - The weight is great in your hands, ergonomical and comfortably balanced. Pleasant to hold and to use. The long handles making it easy to scoop the coffee from tall containers and coffee bags without getting coffee grounds all over your fingers. [ SO MUCH MORE THAN A COFFEE SCOOP ] - Accommodates all of your measuring needs including coffee, tea, sugar, flour, spices, supplements (protein powder, creatine etc. ), liquids, stevia, and more! The perfect addition to your other set of kitchen gadgets and accessories. [ DISHWASHER SAFE & RUST PROOF ] - You can put them in the dishwasher and they come out perfect every time with no damage or discoloration, do not tarnish or spot for quick and easy clean up. Try it risk free, we know you'll love it! If you have any questions about this product by Onlycooker, contact us by completing and submitting the form below. If you are looking for a specif part number, please include it with your message.